5.2. What Adulterations Can Fluorescence Emission Spectroscopy Be Used to Detect? Advances in Food Authenticity Testing covers a topic that is of great importance to both the food industry whose responsibility it is to provide clear and accurate labeling of their products and maintain food safety and the government agencies and organizations that are tasked with the verification of claims of food authenticity. The adulteration of foods with cheaper alternatives has a long history, but the analytical techniques which can be implemented to test for these are ever advancing. 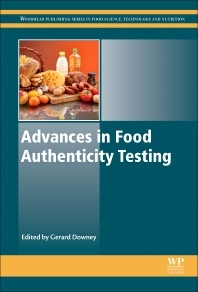 The book covers the wide range of methods and techniques utilized in the testing of food authenticity, including new implementations and processes. The first part of the book examines, in detail, the scientific basis and the process of how these techniques are used, while other sections highlight specific examples of the use of these techniques in the testing of various foods. Written by experts in both academia and industry, the book provides the most up-to-date and comprehensive coverage of this important and rapidly progressing field. Gerard Downey is a member of the Food Chemistry and Technology Department at the Ashtown Food Research Centre of Teagasc, Ireland’s Agriculture and Food Development Agency. He also holds the post of Adjunct Full Professor in the School of Agriculture, Food and Veterinary Science at University College Dublin, is a Fellow of the International Union of Pure and Applied Chemistry (IUPAC) and the holder of the 2006 Tomas Hirschfeld Award for Outstanding Achievements in Near Infrared Spectroscopy. He has been active in the application of vibrational spectroscopy to food authenticity and adulteration studies for over 20 years and has participated in many EU-funded projects on this topic.